Well, my DH is away for a few days, and, much as I love him, it sure gives me more spare time in my day to stamp away. So, therefore, I am somehow able to do Mojo Monday ON Monday this week, and I also coordinated a colour challenge from The Paper Players at the same time. This folksy styled card is quite a bit different from my usual vintage style, but it was fun to do and I learned how to make rolled roses as well. Here's a good tutorial on that. 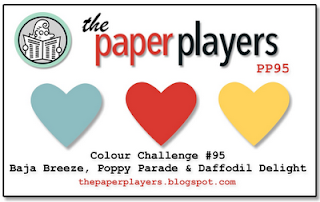 The colours in The Paper Players Challenge #95﻿ were Poppy Parade, Baja Breeze and Daffodil Delight. is a new set called Forever with You, and it just seemed to fit these challenges perfectly. I LOVE THIS CARD! Very cool! It would be nice as wall art too. Look at the new goodies, how pretty! Yes, when hubby goes away, it is time to play with stamping goodies! LOL! I would be doing the same thing! Thank you for joining us at the Paper Players. So very pretty....this set is so fun using these colors! Thanks for playing with the Paper Players and sharing your creation with us! Those roses are wonderful, too! Oh. My. Gosh. I love your use of the rolled paper flowers and Comfort Cafe DSP! You and I were definitely thinking along the same lines. I used this same image and added rolled paper flowers to my Pals Paper Arts card. Your flowers are fabulous and so much better than mine! I need to check out this tutorial! Thanks for playing with The Paper Players. You've created such a pretty card and I love those rolled roses! Thanks for joining us at The Paper Players this week!